Providence Goes Over the Edge! 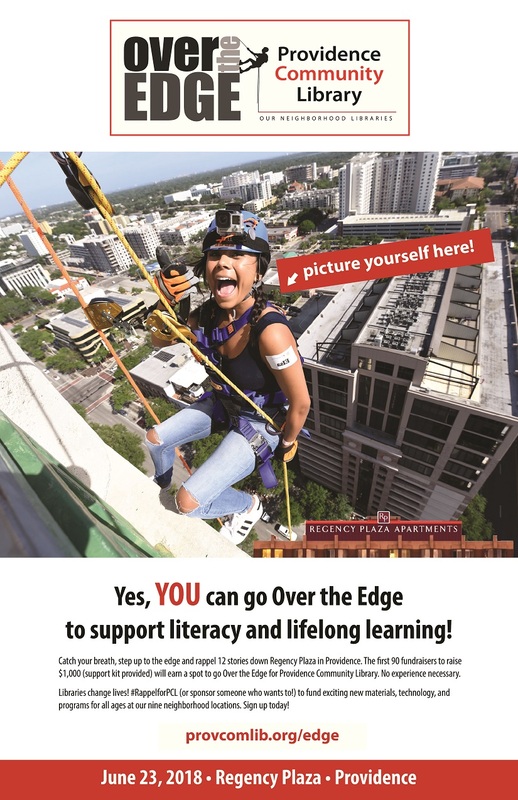 PROVIDENCE, RI – Providence Community Library (PCL) has partnered with Over the Edge to bring a brand new event to the Ocean State this coming June. The fundraiser will feature an exciting opportunity for members of the public to rappel down the 12-story Regency Plaza building in downtown Providence and help raise $100,000 for the nine neighborhood locations of Rhode Island’s largest library system. The event will begin at 9:00AM on Saturday, June 23 and run throughout the day.To secure a place, each participating “Edger” will need to raise a minimum of $1,000 for the chance to go Over the Edge. Potential participants should visit www.provcomlib.org/edge to reserve their spot and create a personal fundraising page that enables friends, family, and colleagues to donate funds toward their rappelling adventure. Registration for Edgers opens today. Over The Edge is a special events company that provides signature events for non-profit organizations anywhere in North America and it is currently expanding globally. Business leaders, individuals and community members are invited to raise donations in exchange for the experience of going “over the edge” of a local building. Over The Edge to date has raised over $70 Million for non-profits around the world, including the Make-a Wish Foundation and the Special Olympics Boston. Sponsorship and promotional opportunities are available for businesses and individuals who wish to help PCL reach its fundraising goal and support literacy and lifelong learning in Providence. To learn more, visit www.provcomlib.org/edgesponsors or contact Steve Kumins. PCL Development Director, skumins@provcomlib.org to discuss a customized option. 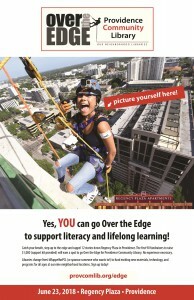 For general information about PCL’s Over the Edge event, visit www.provcomlib.org/edge .